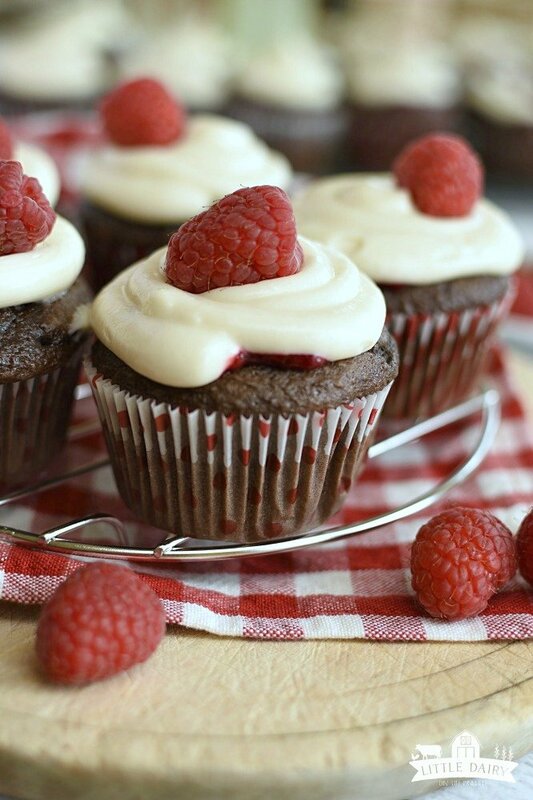 Raspberry Chocolate Cheesecake Cupcakes begin with a decadent milk chocolate cupcake, get filled with tart raspberry sauce, pipe a generous amount of cream cheese icing on top, and lastly garnish with a gorgeous fresh raspberry! Every bite of these cupcakes is like a little party in your mouth! They are just right for summer! My friend Jayci shared one of these cupcakes with me on a week when I was trying to contain myself and not devour dessert at night! I had that little talk with myself the whole way home about how I could just eat it the next day. Well, I got home and snarfed the whole thing down before anyone in my family saw because I didn’t want to share! It was good! So good! Of course I had to get the recipe from her. Better yet, she came over and showed me how to make them! It was fun learning from her and obviously fun eating cupcakes afterwards! Jayci just started a blog called The Moments of Mamahood with a few of her friends. You have to go check it out! She’s such a fun mom to two adorable little girls. She’s a great cook, and a school teacher by trade! I know they are going to fill their blog with all kinds of great ideas! Be sure to check them out and follow them on Instagram! Jayci sent me a little write up to include with her cupcakes recipe! Cheesecake! Cupcakes! Raspberries! So many favorites packed in one dessert! 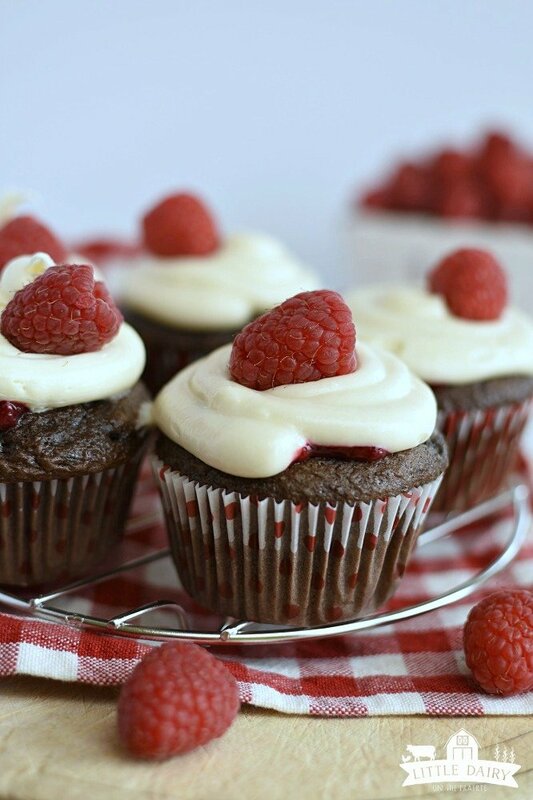 These Raspberry Chocolate Cheesecake Cupcakes have it all! Rich chocolate cake, tart raspberry sauce, and tangy cream cheese frosting are combined in a triple threat that you won’t be able to resist! Hey y’all! So before we get to sharing the deliciousness, let me tell you how I know Amy. She was a church leader for me when I was 8, and again when I was 12, and AGAIN when I was 16. I used to babysit her boys before they got gigantic and Amy and I have stayed friends through all of it! 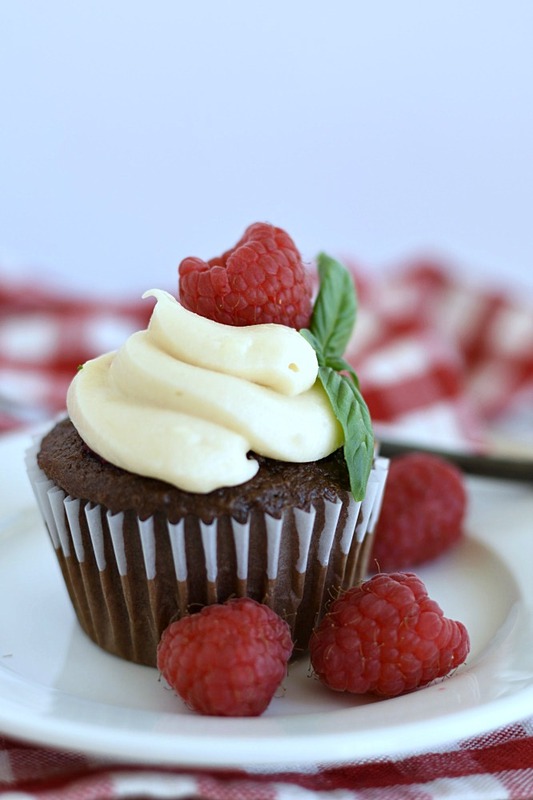 Raspberry Chocolate Cheesecake Cupcakes are perfect for birthday parties! Now let me tell you the story behind these cupcakes. It is a saga that began last year when my husband turned 30. His birthday was a total flop. At the time, we were busy remodeling a house so after work each day he would go to work on the house until late at night and his birthday was no different. He didn’t get home until super late that night and while I did make him his requested dinner and cake, he had to eat them all by himself before he collapsed into bed for the night. And that was the extent of his birthday. Work, work on the house, and a quick dinner and birthday cake. Life was so crazy during that time and I felt bad that I hadn’t made a bigger deal of that big day. They look gourmet without all the fuss! So this year I resolved to do better! I planned a party with all of his favorite foods and showed him pictures of the huge nine layer cake that I was going to make him. But as he looked at that monstrosity I could see the disinterest in his eyes. It doesn’t take much to please him and I could tell that I was overdoing it a bit. But one thing that Amy and I share is that food is our love language. I wanted to make him something different and fun besides the run of the mill birthday cake to show that guy how much I appreciate him. So I nixed the gigantic cake idea and remembered our favorite cupcakes from a specialty shop. I decided to try to recreate the recipe. And they were a hit! There are quite a few steps, but these cupcakes are worth every single one of them. And also, you only have a redo of your 30th birthday once! Thanks Jayci! You are amazing! You can use a can of cream cheese frosting if you’d like. I think it’s worth the little bit of extra time to make your own. You could use raspberry jam instead of making sauce, but raspberry sauce is easy to make and not as sweet as jam. 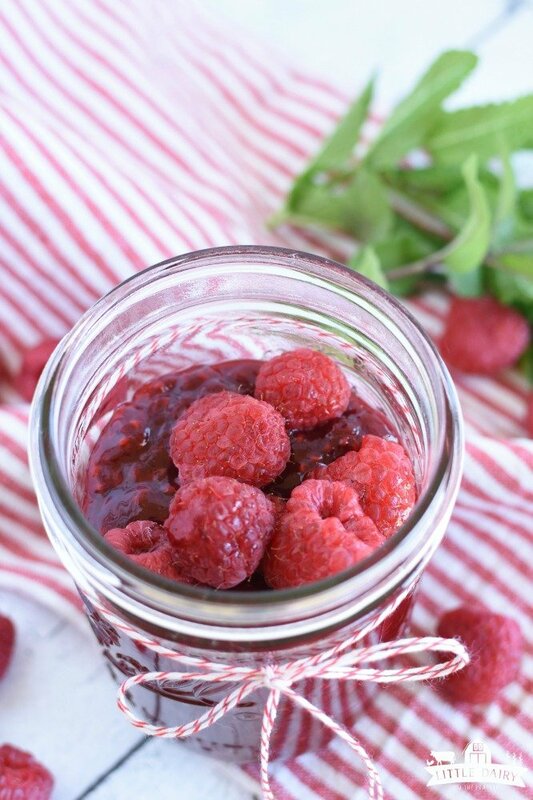 Check out my favorite Easy Raspberry Sauce Recipe! I made Raspberry Sauce for another dessert a few days before making cupcakes so it was already to go. Raspberry Chocolate Cheesecake Cupcakes look more difficult than the are. Here’s some tips. 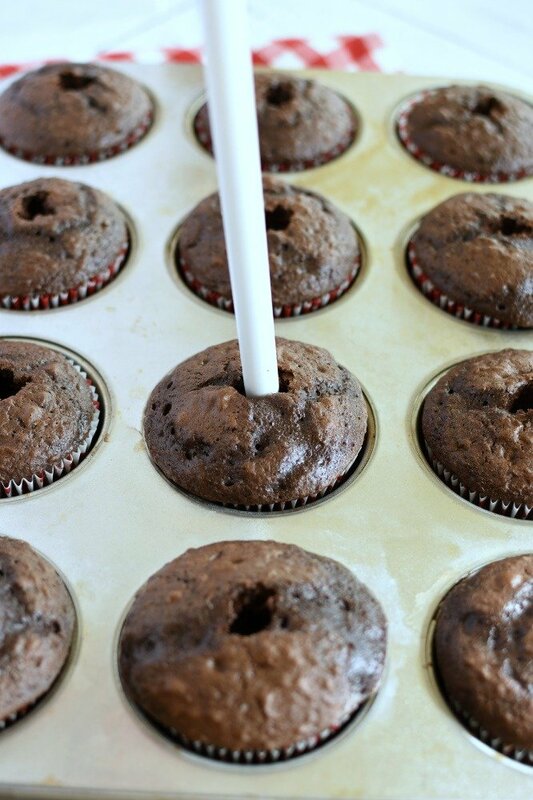 Use the end of a wooden spoon to poke holes tops of cupcakes. You could also purchase a cupcake corer. 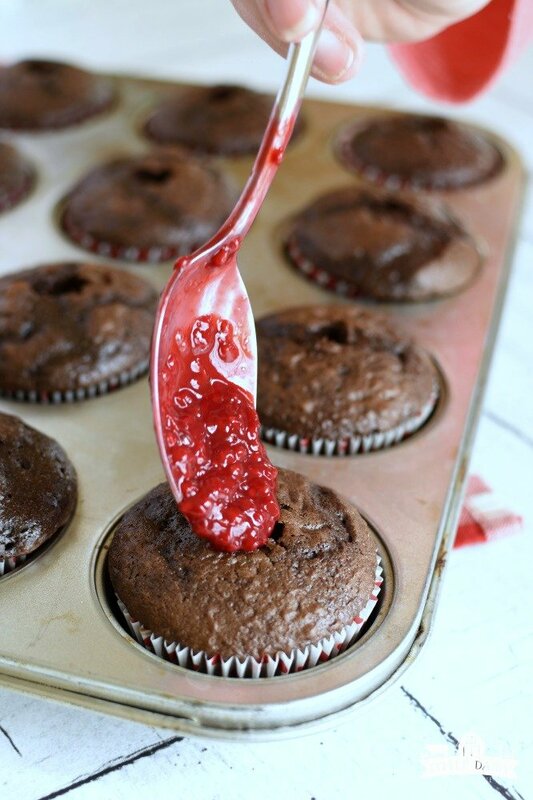 Spoon raspberry sauce into cupcakes while they are still warm; it help the sauce to seep out into the cupcake. Frosting should be at room temperature or a little cooler so it’s easier to pipe. Wash and completely dry raspberries before adding them to the top of the cupcakes, or else the water will make a mess of your pretty piped icing! 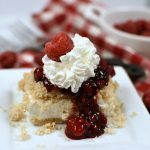 If you are always on the go, yet you still want to be able to whip up gourmet style treats for your family this is your recipe! Raspberry Chocolate Cheesecake Cupcakes are gorgeous, out of this world scrumptious, and much easier to make than you think! Be sure to print the recipe, save it to Pinterest for later, and sign up for my newsletter so you don’t miss anything! Bake cake mix according to instructions for 24 cupcakes. 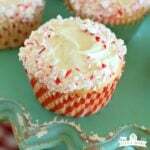 Using a the end of a wooden spoon poke holes in the top of each cupcake. Wiggle the spoon a little bit to make each hole a little bigger than the diameter of the end of the spoon. 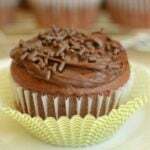 You can also use a cupcake corer to do this. Fill holes in cupcakes with raspberry sauce. Use enough sauce so you can spread a thin layer on top of the cupcakes. Let rest until completely cooled. To make icing beat cream cheese until fluffy. Add butter and beat. Add powdered sugar and vanilla. Beat again until light and fluffy. Add more powdered sugar to make icing thicker, or a little milk to make it thinner. Pipe cream cheese icing on cupcakes. Garnish with fresh raspberries and mint sprigs if desired. Serve immediately or store leftovers in the refrigerator. 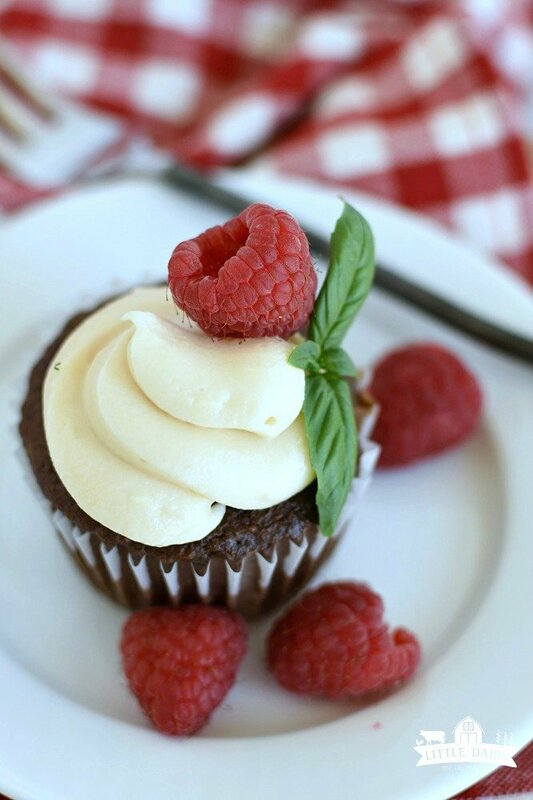 I LOVE that these cupcakes are filled with raspberry! So pretty! It’s one of the best parts! Especailly if you don’t know it’s there and it’s a surprise! Chocolate and raspberry together is one of my favorite combos! And then you go and put cream cheese icing on top? How can I resist!! It’s a triple threat! That’s for sure! These look incredible! 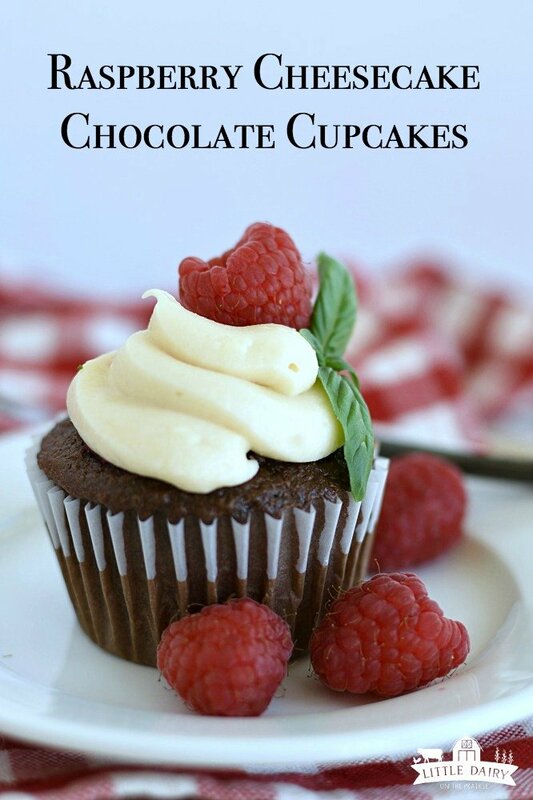 Love the chocolate + raspberry combination! You can’t go wrong with chocolate…EVER! Add raspberries and cream cheese icing and it’s even better! These cupcakes are so elegant! Thanks! They are perfect for summer! Chocolate and raspberries are so perfect together! Those look perfect and so delicious! As soon as I took a bite of the cupcake my friend shared with me I knew I needed that recipe! So yummy! Hey Amy, your combination of raspberry and chocolate is great! 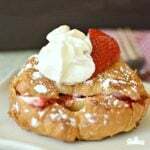 This is one of my favorite combos and putting cream on it, becomes more delicious. Your garnishing idea is also very good. Thank you so much for sharing it. Thanks! These cupcakes are spot on when it comes to summer flavors!